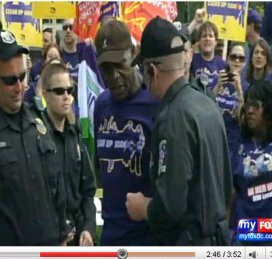 Danny Glover Arrested for Sodexo Protests – see video below, Danny Glover arrested at 2:37 mark. Apparently Danny Glover was arrested yesterday, Friday, along with 11 others who were detained during a protest outside of food services company Sodexo, Inc.
Sodexo, Inc. is a French food services and facilities management corporation, with offices around the world. There have been protests against Sodexo, Inc. across the United States recently, with students being some of the main participants because of Sodexo-run cafeterias. Sodexo released a statement about the demonstrations, saying that it believes they are publicity stunts for a rival food corporation which is trying to take over the market. Glover and the other protesters were later released. Sodexo did the food prep for my cafeterias when I was in college. It had been a smaller company that did it before they took over. The smaller company (forget their name) did an ok job in providing cafeteria food. Sodexo made it seem like we might be in prison the food was so bad. Poor quality to begin with, poorly prepared (often cold or underdone – including pink/red chicken!) and just plain awful. I doubt very much they manage their employees any better than they allow them to cook.